The menstruation cycle is just one of the many processes that humans – women, particularly – undergo that is both expected and unpredictable at the same time. While some women are fortunate enough to have a regular cycle and others are more unlucky to have uneven ones, the necessity of having a menstruation cycle calendar has become apparent, especially for people who wish to do birth control. An important thing to know about a woman’s cycle is that its length can vary every month: short in others, and longer in some; but variation may reach only up to eight days for a regular cycle. Irregular cycles may be the case of polymenorrhea and oligomenorrhea, with the former as the cycle with only 21 days or less, and the latter as the cycle with at least 35 days. A more serious case for irregular cycles is called amenorrhea, which has an interval of 180 days or more. The menstrual cycle chart is easily affected by several factors, including the follicular phase, the ovulation, and the lutheal phase. The follicular or proliferative phase largely depends on the age and diet of a person: the younger the woman and the more low fat diet a person takes, the longer the follicular phase. Oral contraceptives may also tend to prolong this phase. 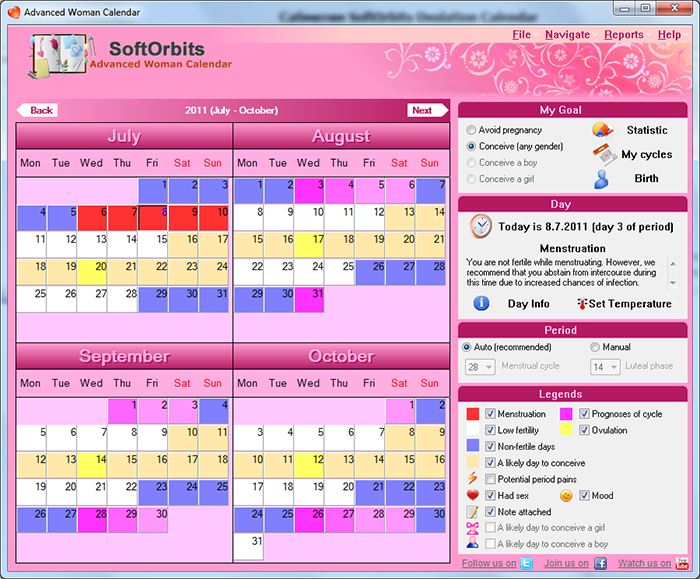 Due to this several irregularities in the cycle of a person, various tools have been devised in order allow women to properly track their cycles. This would help to allow women to have a clearer grasp of when they will have their cycles, and consequently, when is and isn’t safe for a sexual relationship. 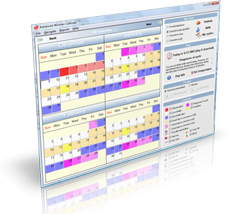 A menstrual cycle calculator has been one of the most practical means for tracking purposes, which is more or less accurate as any other device. This may also be considered to be one of the most convenient and inexpensive, and it is something that can be easily done at home. Hence, calculators and other tracking devices such as Advaned Woman Calendar have become increasingly popular... and we all know why.